One of the things that I love about having a baby is being able to buy tiny little baby clothes and dress them up in cute little outfits. But having three children I have soon realised that babies grow so quick and grow out of their tiny little outfits within a matter of weeks. 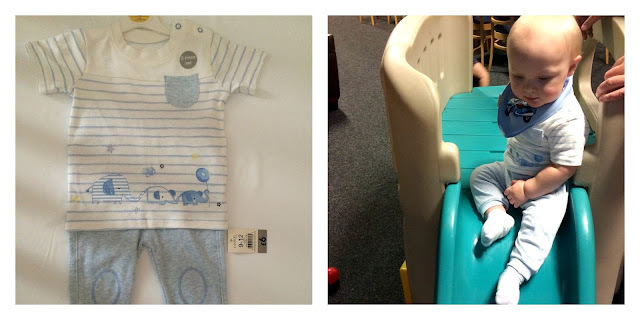 I also realised that it is pointless buying fancy designer baby clothes as 1.) they grow out of them so quick it is a waste of money 2.) they will probably just be sick on the outfit and 3.) a lot of fancy outfits are very impractical for everyday use. 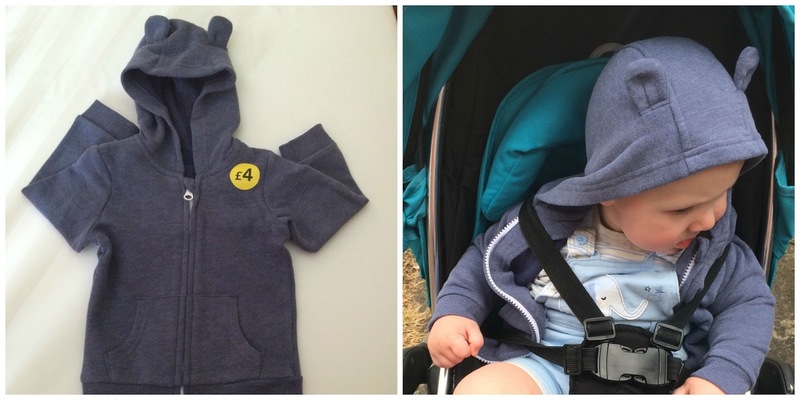 One place that I often shop for baby clothing is George at Asda. I have brought all three of my children's vests and babygrows from here. My eldest wore a George babygrow when she was first born 12 years ago. Since then I have stuck with them for all three children as they are the best around in my opinion, as they are super soft and wash well. I sound like such a mum saying that, don't I. So when I was sent the challenge of dressing Jacob in George baby clothes for a week for the #WBabyWT ( What baby wore today ), showcasing the cute little outfits they have I was well up for the challenge. Firstly I could not believe how much we managed to get as the clothes were such fantastic value. We got a short and shirt set, joggers and t-shirt set, dungarees set with t-shirt and socks, a romper suit, 2 pairs of shorts, 2 t-shirts, a hoody and two pairs of pyjamas for the bargain price of £44. There were enough clothes to last a week as well as the two pairs of pyjamas. So here is a what Jacob wore this week. 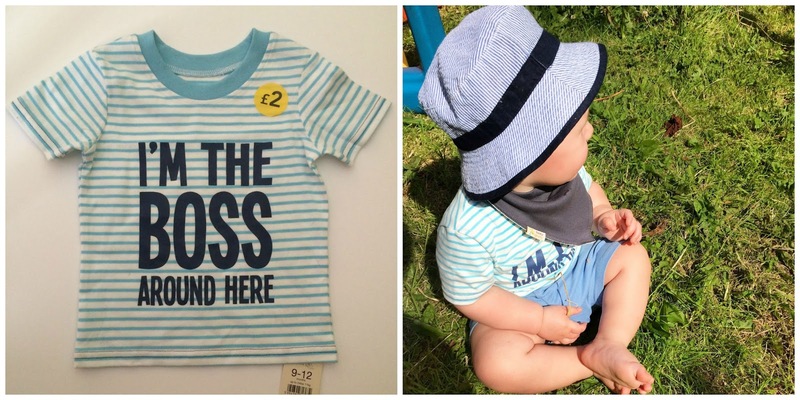 Day one was a lovely hot day so we spent the day playing in the garden and Jacob wore this cute slogan t-shirt which says "I'm the boss around here" and was only £2, he wore it with a pair of shorts out of a pack of two which cost £3 so his outfit only cost £3.50 which is amazing value. We teamed his outfit with a sun hat to protect him from the sun and a dribble bib as he is teething at the moment. Day two we went to the beach so Jacob wore this cute little denim shirt and cream short set which was only £8. He looked adorable wearing it and it was perfect for a day out at the beach. Day three he went out with his daddy for the day to visit family and it was a lovely hot day so he wore these very cute dungaree shorts which were £10 and came with the t-shirt and socks. 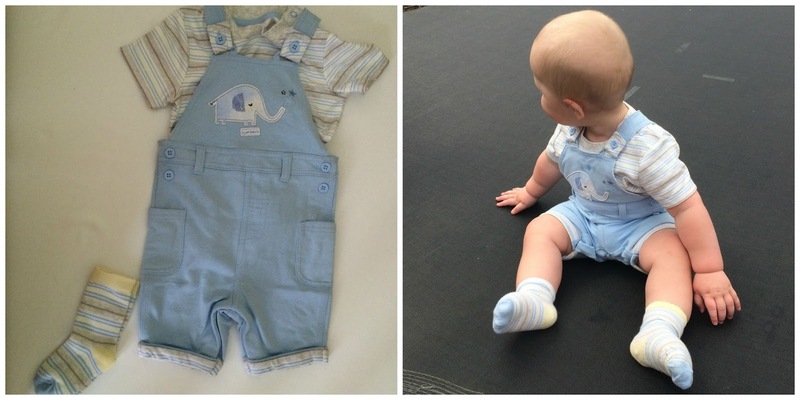 I loved this outfit as it was so soft and very cute and showed off his chubby little legs. Day four we went to soft play and Jacob wore a little jogger and t-shirt set which was £6. This outfit was super soft and perfect for a day at soft play. Day five we had a lazy day at home wearing another cute slogan t-shirt this one says "Mummy's perfect handsome little man" and has a camera on, perfect for a bloggers child who is forever having their photo taken. This was only £2 and he wore it with the other pair of shorts out the two pack we got which cost £3 for the pair, so again this outfit was a total bargain as it worked out at only £3.50. 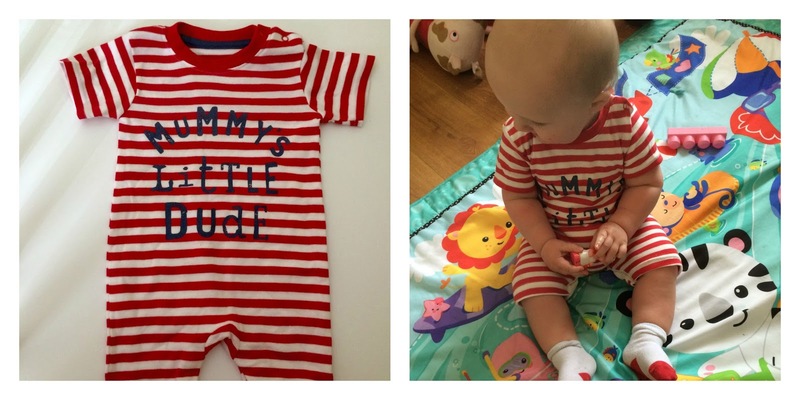 Day six was another lazy day at home wearing this red and white striped romper outfit which says "Mummy's Little Dude". This was £4 and he wore it with some little red and white socks he already had from George at Asda. This outfit is perfect for summer as it is really soft and lightweight and very practical. Day seven we had planned to go out but it was wet and miserable day so we stayed at home watching films and baking cakes, well Jacob watched his sisters bake cakes. He wore the joggers from day four teamed with the t-shirt from day one, and they looked great together. We also had a little blue hoody which has adorable little ears on, I think babies look very cute with ears on there clothing. This was only £4 and is cosy and perfect for keeping him warm if we are out and it gets a bit cold. And lastly, we were sent some pyjamas which were only £5 for two pairs and are really soft and comfortable looking, which I totally forgot to photograph him in. But trust me they are very cute. I have loved dressing Jacob in George at Asda for the week as the clothes have looked great, been super soft for baby's delicate skin, they are practical and comfortable and very affordable. They also wash great too with no fading or bobbling which is testament to the quality of the clothes as they are fantastic quality at great prices. 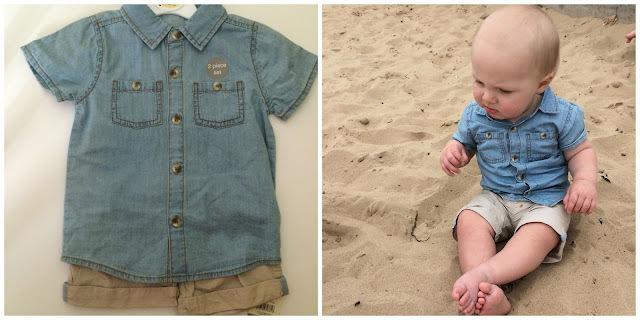 I think that these clothes would be perfect if you are looking for some summer outfits for your little one or if you are going on holiday these would be ideal as you could get a weeks worth of outfits for only £44, probably even less if you brought different items. All the items can also be mixed and matched. 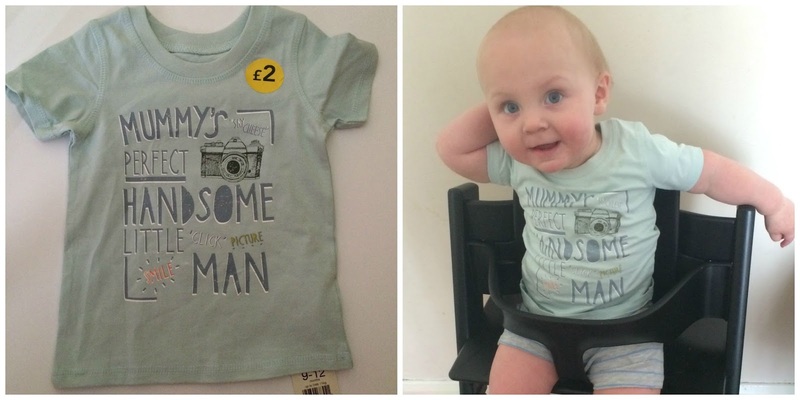 I will defiantly be buying Jacob lots more outfits from Asda as he looked cute in them, mummy loved them and I am sure his daddy will love the price of them. You can view the adorable range of baby boy and girl clothes from George at Asda on the website www.asda.com. Disclosure: We were sent a week's worth of George clothing for the purpose of this review, however, all words and opinions are my own. Love the Mummy's little Dude outfit. Boys clothes are so much better now than they were 9 years ago! Aww he's such a handsome wee man. I used to get all of my baby clothes out of asda when my kids were tiny, they are really good value for money and their clothes are great!